I guess I’ve always thought of Chicken a la King as a farmhouse staple, but then there is that wine! So I looked into the history and I can say my version doesn’t look so close to the version with mushrooms, truffles, and red & green peppers. I’m not even sure where my version came from. Maybe it’s not even Chicken a la King. But what it IS is delish. This updated Chicken a la King is just a little chicken (or Turkey) and the most common of veggies transformed by a creamy sauce with just a touch of white wine or Sherry. Personally, I like the Sherry. And it has an herb that isn’t used as much as it used to be, Marjoram. Marjoram’s like magic with chicken. If you’re a Tarragon person and love that slight licorice flavor you could use that, too. But whichever you use, just use a small touch so it enhances and doesn’t overpower the delicate sauce. Chicken a la King can be served so many ways. One of my fave ways is to serve them over my Popovers in a Muffin Tin. I just think it makes the Chicken a la King feel a little special and those popovers are so easy! Updated Chicken a la King is great over biscuits, toast, and is really good over waffles. Now that’s a Chicken & Waffle I can get behind. Consider, too, mashed potatoes, rice or noodles as an option. Just as a quick aside, when I remade the Chicken a la King, I was really psyched to try to get better pics. I don’t know what the deal was, but my original photo, with all its flaws, just looks like it tastes better to me! I guess I just couldn’t get it together with the lighting and the food styling. It happens. But it’s my old. grainy photo at the bottom of the page that makes me want to dig into this dish! When you make Updated Chicken a la King, you’ll start out with sauteing the veggies in butter and oil; the butter makes it rich and the oil has a higher heat point. I like to keep the veggies on the larger size and I think that simple step is the key to making your Updated Chicken a la King appealing. When the dish is done, the larger veggies look and taste good and still have just a bit of texture. Overcooked, totally soft vegetables never go over well at my house. Now if you have small children who are less likely to eat the larger vegetables, by all means, chop them smaller. Make sure to cook the flour off for a few minutes; it will all but disappear into the veggies but keep pushing them around, turning them and cook off that raw flour taste. A lot of times when egg yolks are added to a sauce like this, they are “tempered” or heated up very gently by putting some of the sauce into the yolks then returning that to the saucepan. I think it’s just as easy to add the yolks and immediately whisk like mad. If your Updated Chicken a la King seems to thin, let it cool for just a minute or two and see if that doesn’t thicken it up enough and if not, very gently simmer a bit longer. If it’s too thick, and it very well might be if any is leftover, then thin it out with a little more milk after the desired temperature is reached. Look for chicken breast when it hits a low, and it generally will be about once a quarter. If it’s in a family pack, break it down and freeze in portions that make sense for your family’s needs. Buy extra and freeze and you’ll always have sales priced chicken to use for recipes like this. Because the chicken needs to be cooked ahead time, this is also a great go to when you have just a bit of chicken leftover from dinner the night before, or even a few vegetables in your fridge. This particular recipe doesn’t use half and half or cream for that rich, creamy sauce which makes it a plus for me (much healthier, cheaper and I don’t normally have either half and half or cream in my fridge.) The egg, instead, enrichens this dish. In a medium saucepan, melt butter with olive oil, add in onion, carrots, and celery. Saute until onion is translucent and carrot and celery is nearly tender but not all the way cooked through. Add in marjoram, then the flour and cook, stirring for about a minute. Add milk, bit by bit, stirring with each addition then bring up to a simmer, stirring constantly, until thickened enough to coat the back of a spoon. Stir the yolks with a fork and constantly whisking add them to the sauce. Stir in the wine and chicken and heat through. Turn off the heat, add in the peas and stir, cover for a moment to warm the peas through. Serve over your choice: Popovers, biscuits, toast, rice, noodles, mashed potatoes, etc. I chose to serve my Chicken a la King over Popovers. 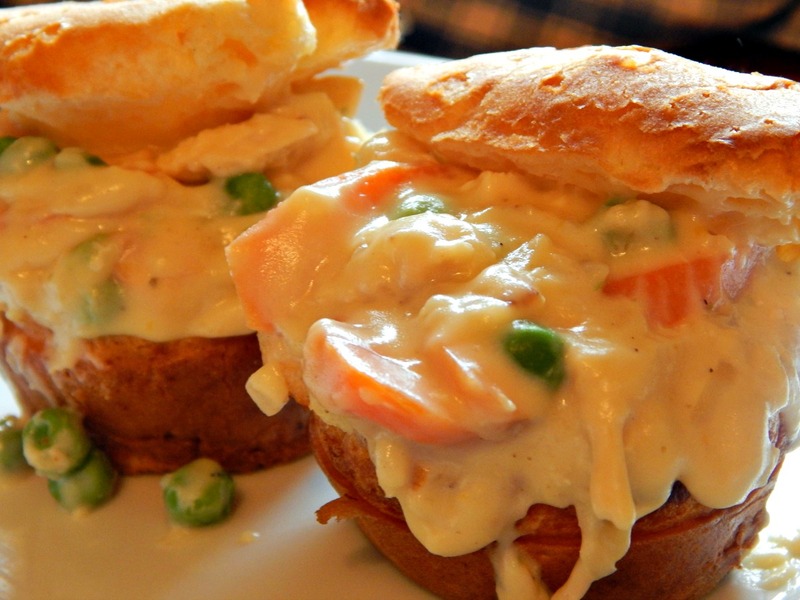 This entry was posted in Click here for Bargain Meals, Click here for Fabulous Food Posts and tagged Bargain Meal of the Week, Chicken, leftover Chicken, leftover vegetables, Leftovers, Peas, Popover, Turkey Leftovers, White sauce. Bookmark the permalink. Dirt cheap and nutritious. My two favorite (or 3?) adjectives! Looks delish! Thanks ladies! Jen, I’m sorry I haven’t replied to your compliments; guess I didn’t see it before!